Broken bones in the wrist are common injuries, and occur in all age groups. Dr. Peter G. Fitzgibbons, MD at The Centers for Advanced Orthopaedics: Maryland Orthopedic Specialists Division is fellowship- trained in both orthopaedic trauma and hand surgery, and is uniquely qualified to care for these injuries. 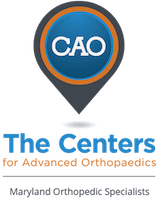 With locations in both Germantown and Bethesda, Maryland, he and a team of orthopaedists, hand therapists, and physical therapists offer a comprehensive range of services covering the diagnosis, treatment, and recovery from wrist fractures. What exactly is a wrist fracture? Most wrist fractures occur at the end of the radius, the forearm bone on the thumb side of the wrist. Sometimes the fracture goes right into the wrist joint itself and sometimes it is near the wrist joint. Wrist fractures can occur at any age but are most common in two distinct groups - children and older adults. Less common wrist fractures involve the small bones that make up the wrist itself. Scaphoid fractures are the most common of these. Scaphoid fractures must be treated very carefully because the scaphoid bone has a limit blood supply by nature and can be slow to heal or sometimes not heal at all (nonunion). Many wrist fractures can be treated conservatively. For children, this usually means a cast for 3 to 6 weeks, depending on the fracture itself. In adults, a fracture brace for 4 weeks is usually sufficient. Whenever possible, conservative treatment is Dr. Fitzgibbons’ recommendation. When fractures cannot be placed and held in an acceptable position with immobilization, surgery is recommended, and this usually means stabilizing the fracture with pins or plates and screws. Once the fracture is healed, or deemed stable enough by the hardware, the motion is initiated with the goal of maximizing function going forward. What is surgery for a wrist fracture like? Surgery for a wrist fracture is almost always an outpatient procedure done with general anesthesia. During the surgery, the fracture is manipulated back into place, sometimes with an open incision and sometimes by visualizing it on a portable x-ray machine. Pins or plates and screws are used to hold the fracture in place. Dr. Fitzgibbons performs most of these procedures at the Massachusetts Avenue Surgery Center, an outpatient surgery center that provides a safe, patient-oriented experience in a friendly and comfortable environment.